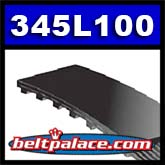 345L100 Bando Industrial Sycnhro-Link Timing belt. 92 Teeth, 34.5" Pitch Length x 1" width. Neoprene (Black Rubber).